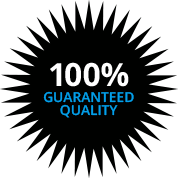 If you are searching a Boynton Beach, Florida electrician that you can rely on for quality work at affordable prices, you can stop looking. Our company, Kasper Electric, has been providing electrical repairs, upgrades, and new construction services in this area since 1978, and we are not slowing down any time soon. We are a second generation family-owned business, so you are working with a down to earth, local company with roots in this community when you engage our services. Boynton Beach is a historic waterfront town that epitomizes the appeal of Southeast Florida, with perfect weather, beautiful beaches, and an abundance of outdoor recreational opportunities. We are proud to be able to serve this extraordinary community, and we will be there for you regardless of where you may reside, from West Boynton Beach Boulevard to Chapel Hill and everywhere in between. If you are a homeowner, you are probably going require the services of an electrician at one time or another. Electrical repairs may be necessary, and you may want to make some home improvements or upgrades that require the services of a licensed electrical contractor. 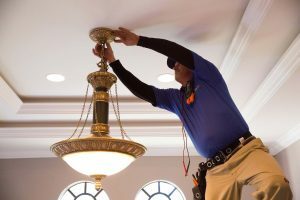 We are always standing by to help any time you need us, and in addition to our indoor electrical work, we are also Boynton Beach, Florida outdoor lighting specialists. Landscape lighting can dramatically improve the appearance of your property, and it is an investment rather than an expense, because it increases the value of your home. Plus, if you are concerned about power outages, we have you covered, because we also install power generators. We can satisfy all of your needs any time you are looking for a residential electrician in Boynton Beach, FL, but we will also be standing by to help if you ever require the expertise of a commercial electrician. 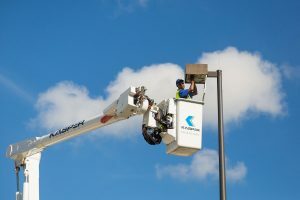 Our team has experience working with all different types of commercial electrical projects, and we have the ability to handle difficult jobs in high places, like parking lot lighting installations. The work that we do in the field is our stock in trade, but we also place a heavy emphasis on top quality customer service from the first moment you reach out to us on the phone. If you need a Boynton Beach, Florida electrician for any reason, call Kasper Electric at 561-285-8036.